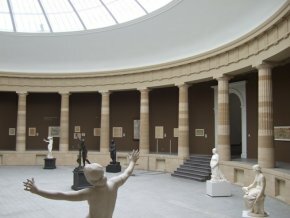 Late May 2007, the Musée des Beaux-Arts in Ghent reopened its doors after a four-year closing for renovation work. Little has changed in terms of the entrance hall to welcome the public but such essential elements as the electrical system, the lighting of the works and security measures have been entirely upgraded. Other improvements include the cafeteria, the bookshop, the auditorium and the library which have also benefited from this remodelling. Renovating a museum, unlike an exhibition, generally takes several years so it is not too late to talk about it as well as the choices in the hanging arrangements. The museum is located in a beautiful Monument Historique building (ill. 1) erected in 1902 by Charles van Rysselberghe, the painter’s brother, and enlarged in 1913. The three main Flemish museums, Bruges, Antwerp and Ghent have tacitly agreed to complement their respective collections by specializing in different areas to avoid useless competition. 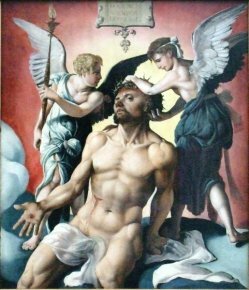 Thus, Bruges is known for its Flemish Primitives, Antwerp for Baroque Art and Ghent for the XIXth C. Notwithstanding, the latter also owns a rich collection of old paintings (notably XVIIth C. Flemish works) and continues to acquire anything concerning local history. The three museums also work together in drawing up their exhibitions programs. The hanging is wisely thought out, associating paintings in a pertinent manner. We might point out only one drawback, a choice fully assumed by the establishment : the works are not close enough (ill. 2), displaying fewer objects in excellent conditions, true, but leaving an extensive number of them in the reserves. Those on display are of first quality, presenting in old paintings : two by Hieronymus Bosch, numerous Flemish Baroque artists (Rubens, Jordaens, Van Dyck, several Crayer...)and some beautiful Italian canvases. 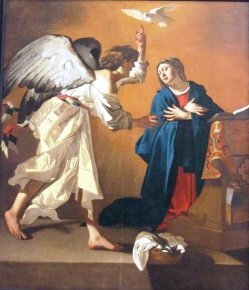 We reproduce here for enjoyment a painting by Martin van Heemskerck (ill. 3) and an Annunciation by Jan Janssens (ill. 4). Many works were recovered from municipal buildings and have reintegrated the museum’s collection, such as a large Theodoor Rombouts (Allegory of a Court of Justice) which had been at City Hall for a long time. The XIXth C. is particularly remarkable, starting with French art and the famous Kleptomaniac by Géricault, along with landscapes from the Barbizon school. Belgian painting is of course very well represented here with works by Joseph Paelinck, Sophie Rude, Joseph-Benoît Suvée (for which an exhibition will soon open in Bruges and which we will talk about) and François-Joseph Navez. 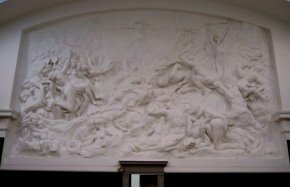 In the same gallery, one can admire sculptures by Jeff Lambeaux, among them a gigantic plaster of the Passions Humaines (ill. 5) which is the model for the marble work located inside the Victor Horta house in the Cinquantenaire Park in Brussels. Georges Minne has a whole rotunda almost to himself. There are also paintings by James Ensor, one of which was acquired just recently (a News item will soon appear) as well as Surrealist works (Magritte, Delvaux,..). An exhibition on English art is opening, which we will discuss on this site. 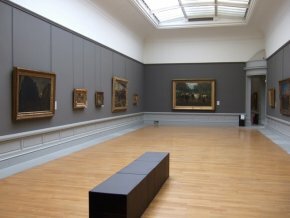 Unfortunately, due to a restricted number of galleries organizers are forced to empty the building of a part of its permanent collection, which is a pity. However, the museum goer can at least consult the reduced two-volume catalogue published on the occasion of the reopening. Catalogue in two volumes (English and Flemish edition) : Paintings catalogue, MSK Gent, 2007, 189 et 383 p. ISBN : 9789081180825.